George and Linda Fracek dance together during the 2015 GHS Prom. Fracek, who retired from teaching at the end of the 2014-15 school year, has been named Grand Marshal for the 2015 GHS Homecoming parade. One simple word sums up how Linda Fracek said she feels, after being picked by members of the Grove High School community as this year's homecoming parade grand marshal. Fracek, who retired in May, taught speech, AP language arts and AP literature at GHS for 14 years. Prior to that she taught for seven years at Vinita High School. "I'm honored and very touched to be chosen," Fracek said. "This is the first year, in 21 years I didn't start the [school] year with an AP class. "I miss the kids horribly." Fracek retired from teaching following her diagnosis with lung cancer. Her current prognosis includes beginning a new treatment therapy designed to help her immune system fight the cancer. She continues to take part in activities at both Grove Public Schools and First United Methodist Church, Grove, aided by supplemental oxygen. As part of the homecoming celebration, members of the student council voted honor Fracek by designating a portion of the homecoming t-shirt sales proceeds to the INTEGRIS Grove Hospital Foundation, for use in its efforts with cancer patients. "People who say the youth of America are in trouble only need to come to Grove," Fracek said. "We have a lot of amazing students here. They have lots of heart and compassion." This year's homecoming celebration features a "superhero" theme. Fracek said she is excited to see how the students interpret the theme in the grade-level floats. A native of Bartlesville, and graduate of University of Oklahoma, Fracek and her husband, George, returned to northeast Oklahoma 21 years ago in order to care for her parents. The Fracek family relocated to Grove from Chicago. 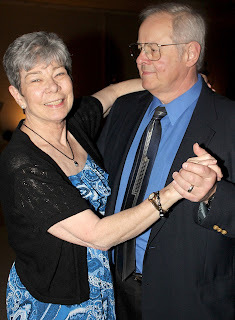 Fracek and her husband have been married for 37 years. The couple met in a piano bar, housed in the building in which George Fracek lived in in Chicago. Fracek said her best friend was an entertainer in the bar and set the couple up on their first date. "Obviously she was right," laughed Fracek, about the couple's compatibility. The couple have two adult children. Both have followed in Fracek's footsteps and become educators. Daughter Elizabeth Nalagan and husband, Robert, reside near Oklahoma City, where she manages the tutoring center and teaches adjunct freshman composition classes at Rose College in Midwest City. Son Matt teaches social studies at GHS. "There's a strong teaching tradition in my family," Fracek said. "In these economic times, it's one of the stable jobs they could find that they enjoy." Always the educator, Fracek said she is currently re-reading the works of Edith Wharton, a Pulitzer prize winning American novelist. While she's not walking the halls of GHS each day, Fracek hopes her students continue to remember one simple message, one that she's been known to say constantly throughout the years "hard work pays off, be a scholar." She said she often admonished her advanced students, who might have arrived to class unprepared, "What's wrong with you people, this is an advanced class, be scholars. You will only get out, what you put in." I've always been inspired by my colleagues at the high school. If you think teachers are ruining education, come to Grove High School. They are amazing, caring skilled teachers, whom I had the privilege of working with everyday. For the last five to seven years, I've assigned my junior literature class Tuesdays With Morrie and asked them to choose a person to be their Morrie and write their memoir and why he/she influenced them. I've been struck by [Morrie's] attempt to navigate his journey to death. There are many things that bolster me in this time of life. Like Morrie saying "in bed you're dead" - that inspires me to get up and get moving every day, even when I don't feel like it. or "Love each other or die" - love is what binds us all together. I did exhibition ballroom dancing in high school. In Bartlesville we had the Canasta School of Dancing, where we all went to learn dancing - it was a very southern thing, and something we all learned to do. At the end of the season, the dance lady chose a few of us to work with, to show people what ballroom dancing was like. We would go to the Kiwanis and other meetings. It was back in the day I could wear and dance in high heels. Cheetos, the crunchy ones. They are the perfect snack. They go with everything or you can eat them by themselves. This story originally appeared in the Friday, Oct. 2, 2015 issue of The Grove Sun.